Beautiful Creatures Blu-ray Review So you really feel like you are watching the same thing over and over. From the word go, it is completely obvious that Beautiful Creatures was one book that shouldn’t have been made into a movie. If you have read the book, this will come as a shock because it reads like it wouldn’t be too hard to bring to the screen in a respectable way. Yet, director Richard LaGravanese, who also wrote the screenplay, made some decisions that have made the outcome less than desirable, especially if you read the book. Set in the uneventful South Carolina town of Gaitin, Ethan Wate (Alden Ehrenreich) can’t wait to finish high school and leave behind everything he has ever known. That is until the mysterious and beautiful new girl, Lena Duchannes (Alice Englert) shows up and suddenly everything Ethan has ever known is questioned. Lena is the niece of Gaitlin’s “Boo Radley”, Macon Ravenwood (Jeremy Irons) who is rarely seen outside his house and rumoured to have demonic tendencies. Ethan soon learns that Lena is a caster, which is a form of supernatural being much like a witch. On her sixteenth birthday she will be claimed as by the good or bad side, in which if she is claimed for by the bad side, it will be the end of her and Ethan. LaGravanese has a lot to answer for. True, Beautiful Creatures by Kami Garcia and Margaret Stohl is a long (but not overly long) book and a lot would have to be done to fit it all into a two hour film. However, the changes he made just do nothing to help the film in regards to its suspense and intrigue of the story. For those who have read the book, they will see the excuse of having to fit everything in as not plausible considering he actually added a scene in which gives away the biggest twist in the book in the middle of the film. In the special features, LaGravanese says that he wanted to focus more on the love story between Ethan and Lena rather than other aspects of the book as he had to cut so much out. This doesn’t explain why he felt it necessary to change one of the most crucial parts of the book and ruin the type of movie it could have been. As a result, we see barely any suspense or intrigue throughout the whole film. As much as the story of teenage love between a mortal and immortal is very in fashion at the moment, Beautiful Creatures doesn’t have a story exactly like what we are so accustomed to hearing. It has so much potential to be a great and interesting film, but just falls flat. The visuals of the film are quite beautiful. Gaitlin itself is quite a picturesque town and captures all the South should be. The scenes in which the Civil War era are recreated are also exquisite thanks to amazing costume design. The special effects aren’t quite as up to scratch as they should be, especially in the dinner party scene which is just a bit more funny than scary, as it supposed to be. The dramatic music to accompany “intense” scenes is just so over the top and a little too loud to cause much change in the viewer’s emotions. It is interesting to see a story such as this told from the male’s perspective rather than the female’s perspective. Alden Ehrenreich is really very good as Ethan, and perhaps is the best thing about the film. He is a complete natural and outshines his female co-star, Alice Englert at all times. Englert is not extremely charismatic as Lena, and is actually a lot more interesting to listen to when she speaks in the special features on the blu-ray. She does a mediocre job, but Lena is a very complex and exotic character and this is not transferred to the screen at all. Emma Thompson, Viola Davis and Jeremy Irons are also very good in their roles. The special features on the blu-ray are almost as much of a disappointment as the film. 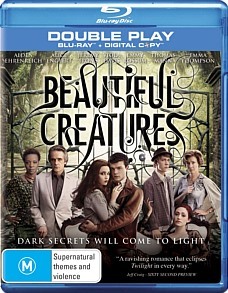 Besides the deleted scenes and alternate scenes, there are four short featurettes about the making of Beautiful Creatures. Although some parts of these featurettes are interesting enough, the most irritating aspect of these featurettes is that each one contains recycled footage from the other featurettes. So you really feel like you are watching the same thing over and over.